Invented by Geoff Hall and patented in 2009, Blackjack Switch is one of the various blackjack variations. Many players choose this over the other games because of its house edge and uniqueness, even though its rules make it slightly more complicated than the other blackjack variations. There are some rules that are in favor of the players and some that favor the dealer. However, the most interesting part is dealing two hands instead of one to a single player. Depending on the casino rules, it can be played with four, six or eight decks of 52 cards. For more detailed information about the game read this article. The main difference between the classic blackjack games and the Switch version is the fact that instead of one hand per player is played with two hands. Players have two betting boxes, while the game can be played with four, six or eight decks. 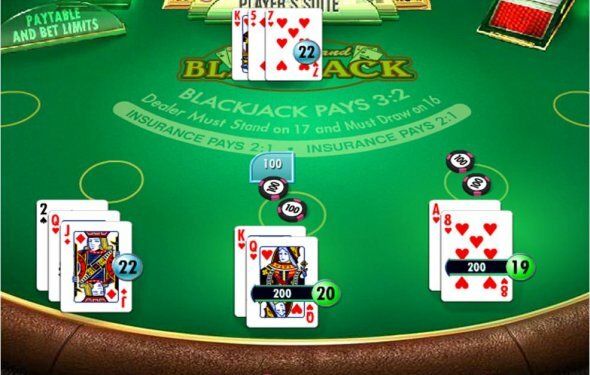 Otherwise, the playing layout is relatively similar to the other blackjack games. Since there are two hands and two betting options, there are also two placed bets for every of the hands each. The bets are split or doubled independently during the game. The game starts with the dealer dealing one card to each player and one face-up card to himself. Then another round of cards is dealt and players can choose to place side bets. Having seen their two hands, players can decide to switch the top cards of each hand. For example, after being dealt 10-8 and 3-10, by switching the top cards the player will continue the game with 10-10 and 3-8 combinations. As the name suggest, what makes Blackjack Switch unique is the rule that allows players to switch the top cards of their two hands. Each hand is played separately and the player can hit, stand or double. After the dealer plays his hand, the value of 22 is considered a push against all other values except for a player blackjack. If the players hand exceeds 21, it is considered a bust. The blackjack payout is 1:1, while the normal payout is 3:2, and the dealer hits on soft 17. It must be noted that if the player switches to a blackjack, it is counted as 21 and a dealer blackjack or 22 will win the game.